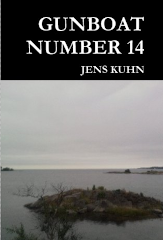 T-K had an article about the Red Fox twin-keeler in one of the pdf-issues long ago. Now I recieved this first hand account from an owner, Guy Wilkes from the UK. The Red Fox / Hunter 20 has been around in various forms for a number of years. 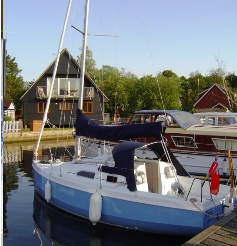 We have had our RED FOX 200T since the end of 2004, spending 4 enjoyable years with it based on the Norfolk Broads and more recently on the River Orwell in Suffolk. 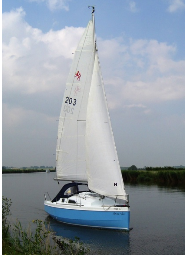 With a draft of only 0.7m (2ft 3inches), the twin keels of the Red Fox make it ideal for the inland waterway network of the Norfolk Broads, and for the creaks and coastal areas of the East of England. Who needs a depth sounder when you can see the bottom! Down below the accommodation is open plan but surprisingly roomy for a boat of this size. There is a V-berth up front and two straight side seats giving 4 berths (realistically enough room for 2 adults / 2 children). 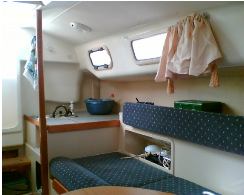 Moving aft, there is a simple galley with a sink, cold water tap and a stove to port. The separate heads compartment with a sea toilet, sink and cold water tap is situated to starboard. To have a separate heads compartment is quite unusual on a 20’ boat. The accommodation benefits from having no intrusive centreboard box or lifting keel. The Twin keels have allowed the designers to really use the space inside and we have found that there is more space in this little 20 footer than on many 25-26fts. We have added a Spray-hood and full cockpit tent, which increases the “usable space” in the evening (or when it is wet) and to allow for a bit more flexibility. The twin keels of the 200T make launching and recovery a bit more challenging than say with a conventional lift keel yacht. 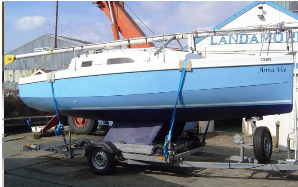 The single axle trailer has a separate 4 wheeled cradle for the boat, which then sits on the trailer and is winched into and out of the water (the theory being that the cradle gets wet and not the trailer). All I know is that from my experience everything seems to get wet including the person recovering the boat. However it avoids those expensive lift in / lift out charges that most of the marinas seem to charge these days. We trail the boat behind a standard family estate car, which is fine most of the time. However we do struggle on some steeper slipways during recovery. If we used a small 4x4 it would probably be slightly better and solve this problem. However for us we manage. Sailing the boat, she tends to (and actually needs to be) sailed fairly upright. The keels are set quite far apart with their roots quite close to the waterline. Despite having the shallow draft of 2ft 3inches she remains remarkably stable (which was one of the key requirements for the family). We do seem to sometimes slip sideways more (in certain conditions – lighter airs for example) but perhaps that might be down to the helmsman rather than the boat. The big bonus is being able to sail single handed and having all lines coming back to the cockpit. Under power we use a 4hp Mariner Outboard which sits in a well in the cockpit. The big advantage of having a cockpit well is that we don’t have to struggle lifting the outboard over the stern. We do of course loose some cockpit space. 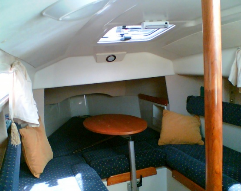 We have found that there are not that many boats of this size that can comfortably accommodate 2 adults and 2 children overnight (or even for a week) and that are equipped with a simple (but functional) galley; have a separate heads compartment and on top of this still have decent sailing qualities. For us the Red Fox ticks all these boxes. 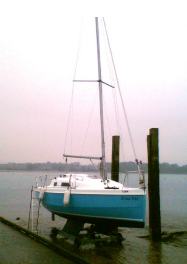 The twin keels means that we can take ½ tide moorings and not worry if she sits on the bottom. In fact on our present mooring she is still afloat most of the time. As an added bonus is the ability to be towed home at the end of the season and sit on the drive for the winter months. Suddenly our hobby is much more affordable than one might initially think. For those that are interested, Select Yachts stopped building the Hunter 20/Red Fox 200 last year when they ceased trading. However the boat is now being built by British Hunter and is now known as the British Hunter Fox 20. It is available with Twin Keels or Twin Lifting Leeboards.